This is one of two named, paved passes on the plateau between the dolomites and the Ortler Group of the alps. Even though Gampenpass is higher than the nearby Mendelpass, the later has the better views of the dolomites, while Gampenpass is a better vantage point on the Ortler Group. 01. (00.0km,291m) START-END NORTH: start of Gampenstrasse south of Merano. 03. (37.0km,1037m) upper end of Fondo. bypass turns off to left and rejoins SS42 shortly afterwards. From East. 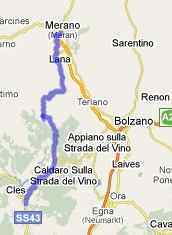 The road to the pass starts on the west end of Meran. But coming from the downvalley area in Bozen, one can stay on the high west side of the valley and climb through the towns of Nals, Prissian and their castles and join the Gampenpass road in Tisens. Once on the main route, the road climbs in forest, opening far views onto the dolomite area. The top comes as a surprise, and offers no views, nor is it an attractive area. On weekends the sides of the road serve as impromptu parking lot for the nearby Gasthof. From West. (described descending) The really nice mountain views of the Ortler Group are further down the pass. They start a little bit above St. Felix and stretch down to at least as far as Fondo. As you approach Fondo, deep limestone canyons make up the scenery. In Fondo many cyclists turn back uphill to climb Mendelpass. But in order to get the full elevation drop you have to descend further into the val di Non or val de Sol. Pictures: First picture taken near the town of Prissian, which is not on the lower ascent from Meran, but an alternate approach through Prissian. Lower picture is a telephot shot of the Ortler group as seen from a bridge near St Felix. Gampenpass , Mendelpass: Andrian > Tisens > Gampenpass > Cles > Fondo > Rufre > Mendelpass > Frangart > sp: 49 miles with 6100ft of climbing in 4:5 (VDO MC1.0 m4:9.6.2).